For my ramen bowl, I ordered my favorite the Shiromaru Motoaji Special (Php 490). The Shiromaru Motoaji Special is Ippudo's original tonkotsu broth with soft boiled egg, pork belly and seaweed. I'm a huge fan of this Ippudo classic that this comes to mind whenever I'm craving for ramen. I highly suggest you order this with very hard noodles. For dessert, I was served the Black Sesame Ice Cream (Php 160). 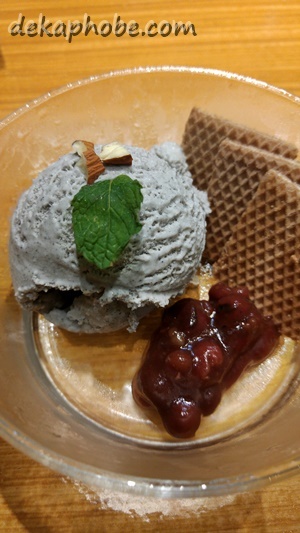 The Black Sesame Ice Cream is served with red bean paste and wafers, a lovely way to end a delicious meal.